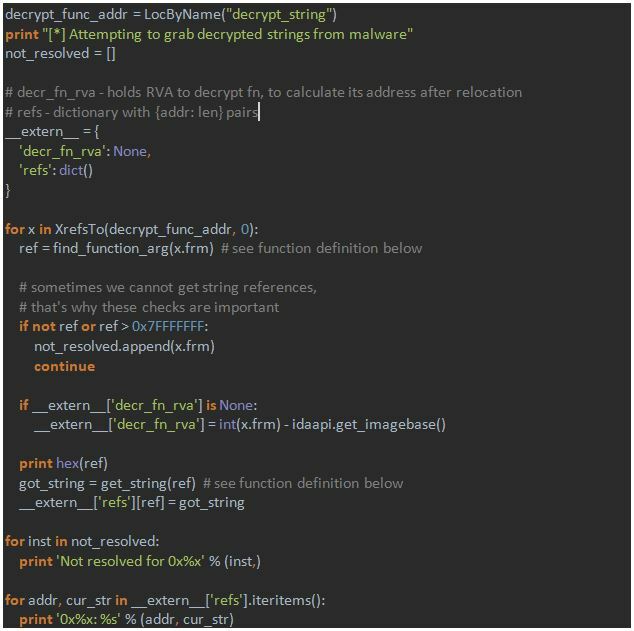 Home / Research / Labeless Part 5: How to Decrypt Strings in Boleto Banking Malware Without Reconstructing Decryption Algorithm. 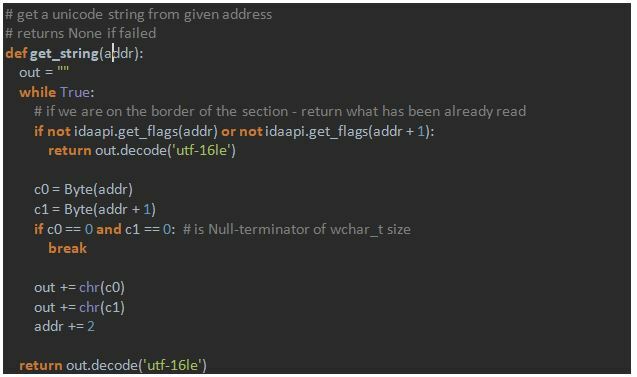 In this part we show how to decrypt strings present in the module of Boleto malware – without reconstructing the decryption algorithm. If you’re new to all this Labeless stuff though, please refer to the previous articles in this series as they will be helpful in explaining what’s going on here. From all of the possible goals the one for this article is decrypting strings “on the fly” without digging into algorithm internals. For today’s victim we chose the not so shy, modest and innocent malware described above, named Boleto. We will use OllyDbg 2.01 for executing script on debugger side. Real case example where x64dbg is used will be provided in the next article in this series. What is the Boleto Malware? Boleto is a banking Trojan which uses a legitimate signed executable to bypass anti-virus scans and launch its malicious payload. The malware’s arsenal, though, is not limited only to this trick. Boleto consists of two main injected modules, one of which is protected with a highly sophisticated Themida solution. In addition, internal strings in all modules are encrypted which is why it is not clear what’s going on inside the modules upon our initial glance. What is left behind the scenes is how exactly these results were obtained. 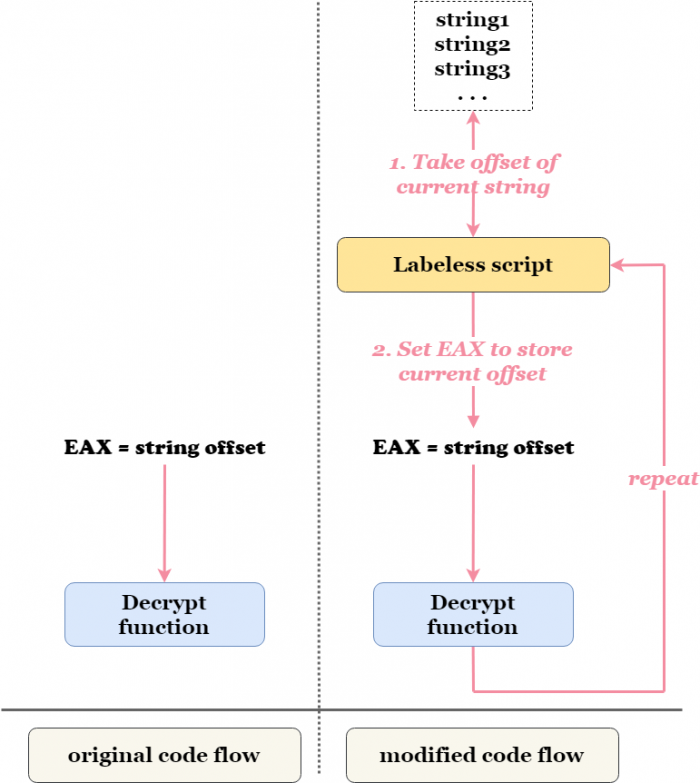 We unveil one part of the analysis and show how we have decrypted strings present in a fake dependent DLL without reconstructing the decryption algorithm. Let’s see how exactly Labeless allows us to interact with debugger. To begin with, let’s take a quick look at our patient. As mentioned in the previous article(link to it), OllyDbg 2.01 is used throughout this article. If you’re on the impatient side, or simply like teasers, and want to get it all at once, you may skip right to the `Results` section and see what we get after all the steps are performed. You could then return here for a step by step understanding of how we achieved it. We see that text is read from the `Tauxilio_turco.bii:TMemo` component which undoubtedly adds some details to the research. Let’s rename the function “sub_6F7D84”, to make it stand out from the crowd, and from now on it will be called “decrypt_string”. 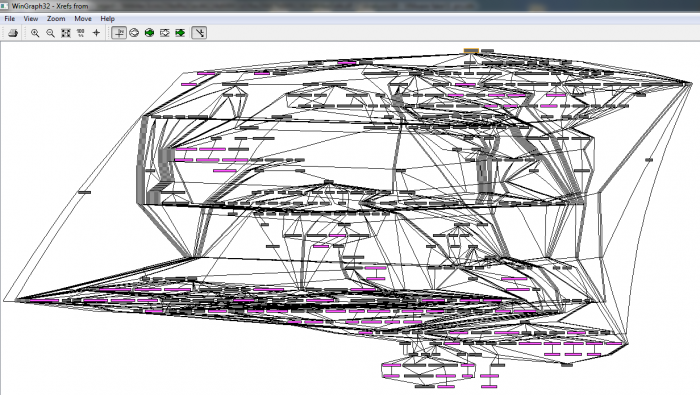 Now we want to decipher the strings as the next step in the researching of this malware. Looks pretty impressive, doesn’t it? Now it seems like we have an idea that we do not want to reconstruct everything in its entirety. To make this scheme work we have to find some place in the code where the target function is called. We then see how exactly it is called and change its arguments. The changing of the arguments will occur for each encrypted string present in malware. So the function is taken as a black box and we do not bother with implementation details at all. First we execute script in IDA to gather all the encrypted strings. 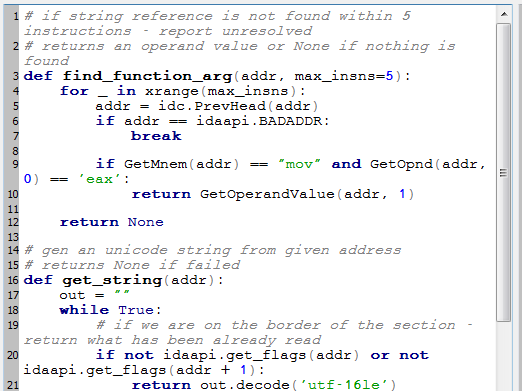 Then we execute script in OllyDbg to decipher them all; the function in the code is being called at this step. Finally, another script in IDA is executed, this time to add decrypted data to the database. We will discuss all three points in turn. At every found address a decrypted string is read – with the function `get_string`. Note that encrypted strings are written to the `__extern__` variable to be passed to the debugger. As we can see, it’s pretty simple: function returns offset if it is found – and “None” otherwise. `UTF-16LE` means that string is in Unicode, thus each symbol occupies 2 bytes (wchar_t type). 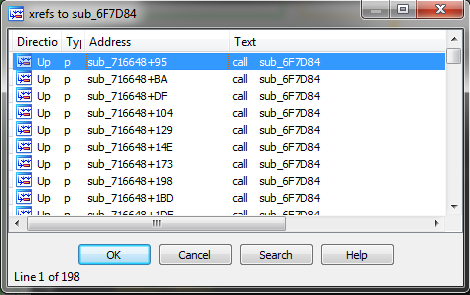 Encrypted strings are here along with corresponding addresses in the code where they are used – nice! 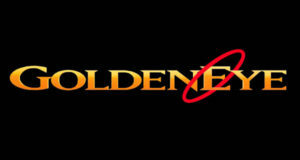 Now we can proceed to OllyDbg side. Each cell represents one byte. The first four store string length whereas others are for the contents itself. Terminating null is not mandatory for Delphi strings. Note that all researched labels are synchronized with IDA database within debugger – even despite image base difference. Synchronization of names and labels is described in the third part of this series. EDX points to another address which in turn holds physical string. With this information in hand we can revert VM back to the snapshot that was just created to the point just before executing `decrypt_string` call. Create a buffer for output pointer (out_ptr). Write decrypted string to output variable (__result__); we have to decode this string to Unicode – see details after the script below. Free allocated buffer from points 1.a and 1.b. Pay special attention that encrypted strings are being read from `__extern__` variable and decrypted strings are being written to `__result__` variable. There are functions from Labeless API here and there in the script. They stand out from the rest because of their structure `ll.[module].[func]`. Please refer to the previous article for more info on the API. Also note that Unicode string contains 4 bytes of length at its beginning. We took this into account in the code. Why do we use string encoding to UTF-16LE? Internally,`__result__` variable uses JSON serialization to transfer the Python variable to IDA side. Serialization may fail if usual Python str is passed and special symbols (non-serializable by default codec) are encountered there. To avoid this peculiarity we pass unicode string so that it can be serialized in any case. You may ask: why to execute IDA script for the second time? To be honest, this script can be deleted from the window. 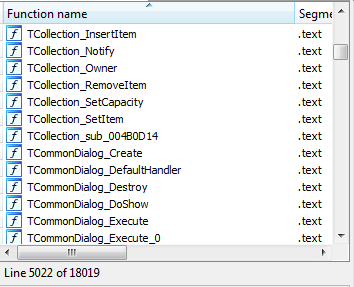 We left it in here to underline the connection between results of IDA script which are passed to debugger side and used in Olly script aftermath. When two scripts are present in Labeless windows, they are executed one by one, from left to right. First goes IDA script, then script for Olly. Press `Run` button at the top left corner and see it for yourself. Now we have all the decrypted strings it’s time to propagate them to IDA database. So far we haven’t seen them…intrigue is growing… What will we see there? Keep on reading and the mystery will be solved. Now we are ready to check the actual resolved results! Some of the strings were not decrypted because malware determines strings’ offsets in runtime. There are only four such discrepancies out of almost 200 strings so we will accept it and look for unresolved strings in debugger. To conclude, we have used malware against itself; malware has the functionality to decrypt strings so we used it right from the original code. We didn’t bother with algorithm reconstruction, ripping assembly instructions, re-writing code in a high-level language – nothing even remotely close to it in fact. Instead we performed a high-level research based on scripting which doesn’t rely on implementation details of malware routines and these script templates can be re-used in future researches. Stay tuned – in the next part of this series we will evolve with Labeless scripting even further. We will show how to decrypt function names by their hashes – without reconstructing the algorithm behind it – in a sophisticated and evil malware, Ngioweb, which is a part of the infamous Ramnit Trojan bot network. Hashes of the malicious ZIP archive are provided above, the module researched in the article is the one with `prs.png` name inside the archive. Credits go to Alexander Trafimchuk (a1ex.t), author of Labeless and an all-round jolly good fellow. crypto2011, author of IDR – the invaluable Delphi research tool.